Below is my recipe for easy ‘no knead’ focaccia. I was particularly pleased that the ‘no knead’ method worked here because focaccia dough is notoriously wet and the kneading part messy and troublesome. This is a great bread to start on a weekend morning ready for supper in the evening. With some good olives, interesting cheeses and a bottle of wine it makes an excellent meal. In the morning, place all the dry ingredients (flour, yeast, table salt) in a bowl and mix well with a wooden spoon. Add the wet ingredients (oil and water) and mix again until just incorporated. The mix will be very sticky. Cover with cling film and leave to rise at room temperature (for at least 8 hours) as you go about your day. Line and oil a tin (20 x 30 cm or one with a similar area) and tip in the dough pressing down gently to the edges so that it is evenly distributed. Preheat the oven to 220oC and put a bowl of boiling water in the bottom of the oven to create steam. Drizzle the top of the bread with extra olive oil and sprinkle with sea salt. Remove from the tin and leave to cool for at least 20 minutes before slicing into thick wedges. NOTE: You could leave the dough to rise overnight for warm bread in the morning, however I don’t consider focaccia to be a breakfasty sort of bread. 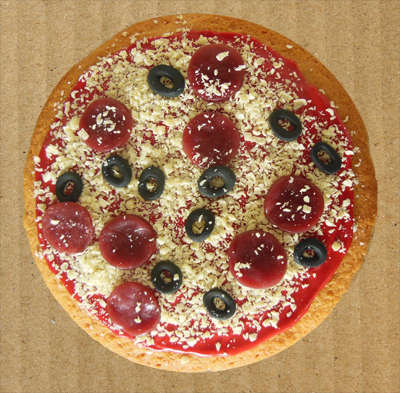 Today I made this birthday cake for a friend who loves pizza. It was very easy and came out quite well so I thought I’d share with you how I did it. The base is just a standard cake mix (see here for a basic recipe) cooked in a 23cm circular tin for 35 minutes. The tomato sauce is icing sugar mixed with a little water and red gel food colouring (I also added some raspberry puree but you don’t have to). The cheese is grated white chocolate. The olives are black fondant icing, rolled thinly and cut out with tiny circular cutters. The pepperoni is made from Kelloggs fruit wind ups scrunched up into a ball, rolled out flat and then cut with a circular cutter. 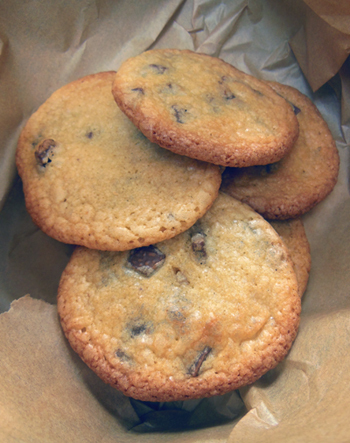 I bake these simple chocolate biscuits when I want to make my husband and son happy because they are both of the opinion that all sweet treats should involve chocolate in some form. But this week I’ve been making them for fundraising volunteers (to spur them on with school Christmas Fayre preparations) and builders (so that they hurry up with the work on my husband’s new shop and give me some real employment in the new year). They’ve proven to be very popular. I think they would also make brilliant Christmas biscuits if you used a Christmassy cutter and some plain white piped icing for decoration. Heat the oven to 180oC fan. Line two flat baking trays with parchment. Mix the flour, sugar and cocoa powder then rub in the margarine until you have fine breadcrumbs. Add the milk and vanilla extract and bring together with your hands to form a soft dough. Knead lightly on a floured surface and then roll out to 1/2 cm thick and cut into 7 cm rounds using a cutter. You can make them smaller if you prefer (and this will obviously make more). Place on baking trays and bake for 15 minutes. 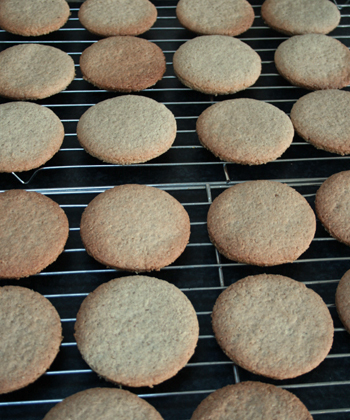 Remove from the baking trays and leave to cool on a wire rack. For the optional chocolate drizzle, melt some dark chocolate slowly in the microwave or over a bain marie (a bowl over a pan of simmering water). 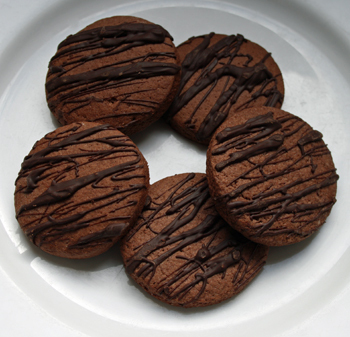 Drizzle the chocolate over the biscuits and put in the fridge for 10 minutes to harden. Or you can forget the dark chocolate drizzle and instead sandwich with Philadelphia and dark chocolate spread, they look like Oreo cookies and are in the same vein as my cheat’s chocolate cheesecake. This is my kind of recipe. It comes from my trusty Be-Ro cookbook (which I’ve been using for over 30 years) and is possibly the simplest biscuit recipe ever. If you’ve never really baked before then this is a great starting point. And I promise that you CAN find the time to give these a go because they take just 5 minutes to make and 15 minutes in the oven (during which time you can empty the dishwasher, check your emails, read your child a story etc, etc). I wouldn’t describe these biscuits as a taste sensation but they do make a perfectly nice everyday biscuit and have a wholesome taste (because of the oatmeal) which is similar to a Hobnob. My husband and son don’t think biscuits are worthwhile unless chocolate is involved so, if I’m feeling generous, I’ll drizzle over some melted dark chocolate (which I put in the fridge to harden) or just smear on some chocolate spread. Heat your oven to 180oC fan and line two flat baking trays with parchment. Mix together the dry ingredients, then rub in the margarine with your hands until the whole mixture resembles breadcrumbs. Using your hands to mix add enough milk (about 1 tablespoon should do it) to make a stiff dough. On a floured work surface, knead lightly and roll out thinly (about ½ cm) and cut into 7 cm rounds. Place on the two baking trays and bake for 15 minutes.